List comprehensions is a pythonic way of expressing a ‘For Loop’ that appends to a list in a single line of code. It is an intuitive, easy-to-read and a very convenient way of creating lists. This is a beginner friendly post for those who know how to write for-loops in python but don’t quite understand how list comprehensions work, yet. If you are already familiar with list comprehensions and want to get some practice, try solving the practice exercises at the bottom. List comprehensions is a pythonic way of expressing a ‘for-loop’ that appends to a list in a single line of code. That was easy to read and quite intuitive to understand. Yes? I prefer list comprehensions because it’s easier to read, requires lesser keystrokes and it usually runs faster as well. The best way to learn list comprehensions is by studying examples of converting for-loops and practicing sample problems. In this post, you will see how to compose list comprehensions and obtain different types of outputs. 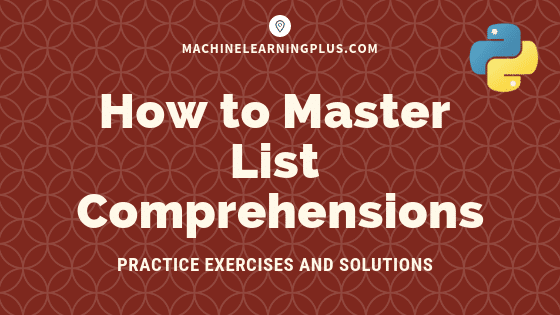 Upon solving the practice exercises that comes at the bottom of the post, you will intuitively understand how to construct list comprehensions and make it a habit. Below is a typical format of a list comprehension. However, this format is not a golden rule. Because there can be logics that can have multiple ‘for-statements’ and ‘if conditions’ and they can change positions as well. The only thing that does not change however is the position of the output value, which always comes at the beginning. Next, Let’s see examples of 7 different types of problems where you can use list comprehensions instead of for-loops. Problem Statement: Square each number in mylist and store the result as a list. The ‘For Loop’ iterates over each number, squares the number and appends to a list. How to convert this to a list comprehension? Take the output in the same line as the for condition and enclose the whole thing in a pair of [ .. ]. Problem statement: Square only the even numbers in mylist and store the result in a list. In list comprehension, we add the ‘if condition’ after the for-loop if you want to filter the items. Let’s see a case where you have an ‘if-else’ condition in the for-loop. Problem Statement: In mylist, square the number if its even, else, cube it. In previous example, we wanted to filter the even numbers. But in this case, there is no filtering. So put the if and else before the for-loop itself. Now let’s see a slightly complicated example that involves two For-Loops. Problem Statement: Flatten the matrix mat (a list of lists) keeping only the even numbers. Can you imagine what the equivalent list comprehension version would look like? It’s nearly the same as writing the lines of the for-loop one after the other. Hope you are getting a feel of list comprehensions. Let’s do one more example. Problem Statement: For each number in list_b, get the number and its position in mylist as a list of tuples. , In this case, the output has 2 items instead of one. So pair both of them as a tuple and place it before the for statement. Same problem as previous example but output is a dictionary instead of a list of tuples. Problem Statement: For each number in list_b, get the number and its position in mylist as a dict. To make a dictionary output, you just need to replace the square brackets with curly brackets. And use a : instead of a comma between the pairs. This is a slightly different way of applying list comprehension. Problem Statement: The goal is to tokenize the following 5 sentences into words, excluding the stop words. Before reading ahead, can you try creating the equivalent list comprehension version? (..pause and try it out in your py console..). But we want to distinguish which words belong to which sentence, that is the original grouping of sentences should remain intact as a list. To achieve this, the entire second unit of for-loop, that is, the [word for word in sentence.split(' ') if word not in stopwords] part should be considered as an output and therefore will go at the beginning of the list comprehension. Question 2: Make a dictionary of the 26 english alphabets mapping each with the corresponding integer. Question 3: Replace all alphabets in the string ‘Lee Quan Yew’, by substituting the alphabet with the corresponding numbers, like 1 for ‘a’, 2 for ‘b’ and so on. Question 4: Get the unique list of words from the following sentences, excluding any stopwords. Question 5: Tokenize the following sentences excluding all stopwords and punctuations. Question 6: Create a list of (word:id) pairs for all words in the following sentences, where id is the sentence index. Question 7: Print the inner positions of the 64 squares in a chess board, replacing the boundary squares with the string ‘—-‘. Today, we covered what is list comprehension and how to create various types of list comprehensions through examples. I hope you were able to solve the exercises and feel more comfortable working with list comprehensions. If you did, Congratulations and I will see you in the next one.